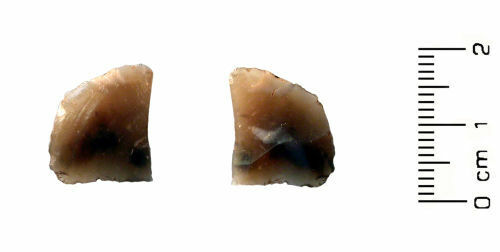 Lower segment of snapped flint blade of probable late Mesolithic date (6500BC - 3500BC). The flint tool is sub-rectangular in plan and broadly sub-triangular in cross section. The bulb of percussion is missing. The two long sides and the lower end of the blade have a limited amount of retouch / rework on them. The majority of this has been applied to the under side of the blade. The retouch is most extensive on the right hand edge, where there is a higher density of flake scars. There is no evidence of cortex (rough outer skin of the flint) on any part of the blade; this suggests that the flake was produced during the later life of the core once this material has been removed. The flint is a mid mottled brown grey colour and has been slightly abraded in the ploughsoil. The source of flint is difficult to ascertain; much of the local flint is procured from glacial and riverine sources. The snapped blade measures 13.3mm length, 15.5 mm width, is 3.5mm thick and weighs 0.83 grams.